Super saucy, tender, juicy BBQ baby back ribs, y’all! Ever since I’ve been a little kid I have loved baby back ribs. Maybe it was because they were super messy and you could eat them with your hands. Who knows! I know one thing though, I LOVED their taste! My mother would frequently make baby back ribs because we loved them so much. I bet my mom would LOVE this oven baby back ribs recipe from The frugal chef. It would save her a bit of frostbite, that’s for sure! Thank you so much The frugal Chef for this uh-mazing recipe. Now, if you’re saying to yourself, “Get on with it lady and show me the recipe!” I totally understand! I could barely wait to start making these, myself! We have a complete list of ingredients and instructions here so you should have a fabulous meal in front of you, in no time. I am seriously so excited about this tasty recipe for oven roasted baby back ribs. It is one of the easiest recipes that I’ve ever come across in my entire life. Thank you so much The frugal Chef for putting this recipe out there for all of us to enjoy. When I was young my mom taught me how to make many things. I loved watching her in the kitchen. 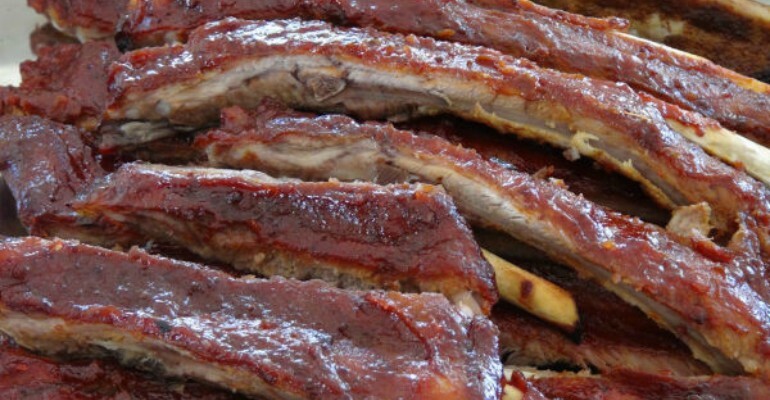 She always made her baby back ribs on the backyard grill…even when it was snowing! However, this amazing recipe from The Frugal Chef YoutTube channel teaches us how to make succulent baby back ribs using the oven in your kitchen. How cool is that? My mom was a strong lady to be braving the winter air outdoors cooking on the grill but I’m not so courageous haha! Prep you ribs by removing the fascia. Mix all of the dry ingredients and rub the ribs well. 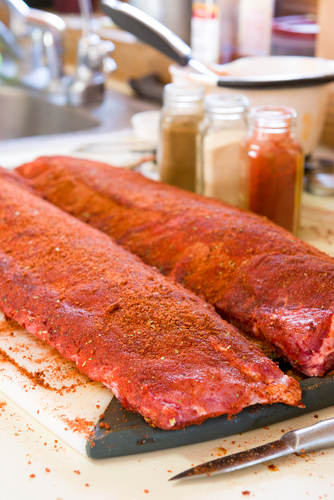 Allow the ribs to sit at room temperature for 30 minutes. Place the ribs on a roasting pan and cover them with foil. Bake them for 45 minutes to 1 hour. Remove the pan from the oven and brush the ribs with a thin layer of bbq sauce. Cover the pan with foil again and bake for another 30 minutes. Remove the ribs from the oven and turn your oven to broil. Generously brush the ribs with bbq sauce. Broil until the sauce is caramelized, watching the ribs very closely and rotating the pan. Serve with extra bbq sauce and lots of napkins! Enjoy! Quick Tip: Serve with mashed potatoes or French fries. Recipe and image courtesy of The Frugal Chef and Youtube.